Cameron (left) and Tyler Winklevoss have decided to end their ongoing legal battle against Facebook founder Mark Zuckerberg. NEW: Facebook says the case has been considered a done deal for "a long time"
The long-running court battle was featured in the film "The Social Network"
(CNN) -- Tyler and Cameron Winklevoss, the former business partners and Harvard University classmates of Mark Zuckerberg, have dropped their court appeal of a settlement with the Facebook founder. The Winklevosses had claimed they were shortchanged in a $65 million settlement with Zuckerberg because Facebook had misrepresented the value of company stock. In April, a federal appeals judge rejected the argument and ruled the twins could not unwind the legally binding agreement they had signed in 2008. The brothers and a third partner, Divya Narendra, had wanted to reverse that ruling and were willing to take the case to the U.S. Supreme Court. But in documents filed Wednesday with the U.S. 9th Circuit Court of Appeals in San Francisco, they said they will not pursue the matter any longer. "We've considered this case closed for a long time, and we're pleased to see the other party now agrees," Facebook spokesman Andrew Noyes said in a statement. Facebook's long-running battle with the Winklevoss brothers was a key plot point in "The Social Network," a 2010 fictionalized movie dramatization of the company's origins. Where did idea of Facebook come from? In late 2003, the Winklevosses and Narendra asked Zuckerberg to help them write the coding for a social networking site they were developing for Harvard and other campuses. Zuckerberg entered into an oral agreement and was made a partner. In February 2004, however, Zuckerberg launched thefacebook.com, which he later renamed Facebook. The Winklevosses and Narendra filed suit later that year against Facebook and Zuckerberg. The trio alleged that Zuckerberg had stolen the idea for Facebook from them. Facebook promptly countersued the trio and their own social networking site, ConnectU, alleging they had hacked into Facebook to steal data and spam users. 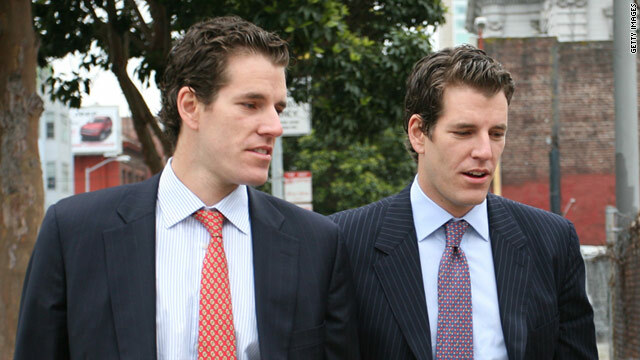 A California court ordered the parties to mediate the dispute, and according to court records, they signed an agreement in which the Winklevosses would give up ConnectU for cash and a share in Facebook stock. The Winklevosses and Narendra later tried to pull out of the deal, alleging that Facebook had undervalued its stock, thus rendering the agreement as having been procured fraudulently. In April, U.S. 9th Circuit Court of Appeals Chief Judge Alex Kozinski, ruled against them. "At some point, litigation must come to an end," Kozinski concluded. "That point has now been reached." CNN's Scott Thompson and Jason Kessler contributed to this report.